Life cycle: Normally a single brood per year. Feeding characteristics: "The Grub Killer." 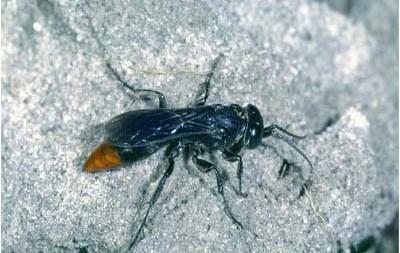 Scolia Wasps are mainly external parasites of Coleoptera. The adult female burrows into the soil in search of grubs. When it locates a grub, it parasitizes it (often killing it with its powerful sting). In some cases she will burrow deep into the soil (up to four feet) dragging the grub behind, before forming a nest cell around the host and implanting an egg.